Partly cloudy skies. Gusty winds during the evening. Low 51F. NNW winds at 20 to 30 mph, decreasing to 5 to 10 mph. Higher wind gusts possible.. Partly cloudy skies. Gusty winds during the evening. Low 51F. NNW winds at 20 to 30 mph, decreasing to 5 to 10 mph. Higher wind gusts possible. Hewitt Public Library Director Waynette Ditto showcases the new musical flowers placed in the library's courtyard after the nonprofit Friends of the Hewitt Public Library raised the funds to purchase the amenities. Friends of the Hewitt Public Library raised about $5,000 for the musical flowers in the courtyard of the library at 200 Patriot Court. Hewitt Public Library Director Waynette Ditto showcases the new musical flowers placed in the library’s courtyard. The nonprofit Friends of the Hewitt Public Library funded the project. 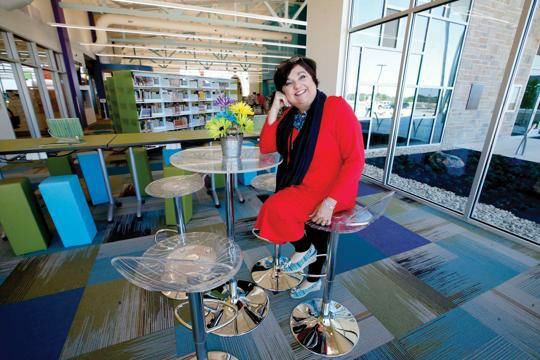 Hewitt Public Library Director Waynette Ditto said the facility, which opened in 2016, has been designated as a Family Place Library. The program focuses on childhood development. Flowers in the Hewitt Public Library courtyard do more than catch the eye. They help with brain development, bring joy and promote a universal language. Each petal of the four metal flowers sounds a different tone when struck with the attached baton. Someone standing in front of a flower could easily create a song, Library Director Waynette Ditto said. The nonprofit Friends of the Hewitt Public Library raised about $5,000 to purchase the equipment from Freenotes Harmony Park outdoor musical instruments. The flowers are installed in the partly covered courtyard at the library, 200 Patriot Court. The recently installed equipment is just the beginning of the library’s musical ambitions. The friends group aims to raise money to buy outdoor musical drums and a xylophone to create the full music experience surrounding the butterfly-shaped area for flowers. The project grew from a conference that Ditto and librarian Kay Carlile attended in New York last year as the library was working to earn a designation as a Family Place Library. Ditto said they learned a lot about how children’s brain development reacts to music and the positive influence created by playing instruments. Ditto said she approached the local nonprofit as money for the flowers wasn’t available in the library budget. The courtyard project complements the library’s new nationally recognized designation as a Family Place Library. The program, which Carlile coordinates, is the first of its kind in McLennan County. Family Place Libraries focus on creating a family-friendly environment by transforming libraries into community centers for literacy, early childhood development, parent education and engagement, family support and community information, according to the organization’s website. The program — offered in more than 250 libraries across the United States — focuses on a message that early learning, parental involvement and supportive communities play a critical role in a child’s development. Hewitt received a $13,000 grant from the Texas State Library and Archives Commission to help achieve the designation, Ditto said. The program offers free classes at the library each spring and fall that are aimed at parents of children up to age 3. Each class connects parents with different local professionals in fields such as nutrition, child development and speech therapy. The informal setting also allows professionals to watch the children play and potentially identify areas for growth, Ditto said. “In communities, people are moving around,” Ditto said. “It’s not like it was even 30 years ago, where if you were born someplace, you stayed there. And you had family or church givers, be able to help you parent. So a lot of first-time moms, a lot of people that don’t have that family support, may not understand child development, the way that it would be if Grandma recognized something. In the spring series that just ended, Ditto said the sessions helped identify children with hearing needs and early autistic symptoms, helped children begin to speak, and connected young families with one another. Carlile said the children play with developmentally appropriate toys. The sessions focus on nutrition, child development, early literacy, music and movement, and speech, language and hearing. During one session, a physical therapist demonstrated to parents at what age their child should be capable of certain movements. The classes are not just for parents who think their children might have developmental issues, but also for parents wondering at what age their children should be able to do certain things, she said. “It can reassure them as well,” Carlile said. The decade-old nonprofit voted to support the project after hearing of the need, said Ann Schiltz, Friends of the Hewitt Public Library president. “It’s always been a group of people who wanted to support the library in ways that go beyond their normal budget means,” Schiltz said. Schiltz said the group will continue efforts to raise money for additional outdoor musical instruments and will take community donations. Hewitt Public Library is evolving from a library to a true community center, Schiltz said. The library opened in its new location in 2016, taking up nearly half of a 26,500-square-foot building it shares with Hewitt City Hall. City Manager Adam Miles said the flowers are similar to the musical activities at the Cameron Park Zoo, adjacent to the orangutan exhibit. The flowers sound similar to wind chimes when played, he said.